Another nice start to the day. 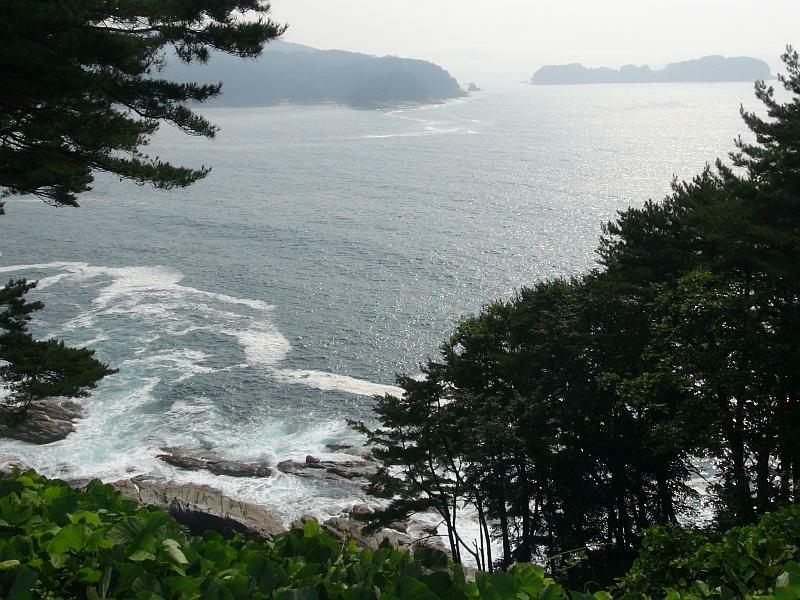 Easy gradients as Route 45 skirts alongside Funakoshi Bay. 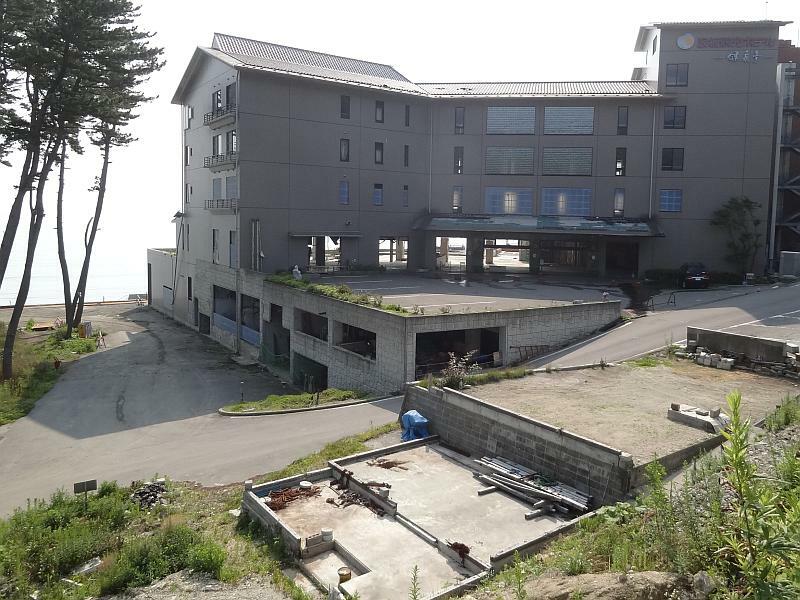 Pass Namiita Kaigan where another large hotel adjacent to the beach has been swamped by a giant wave. 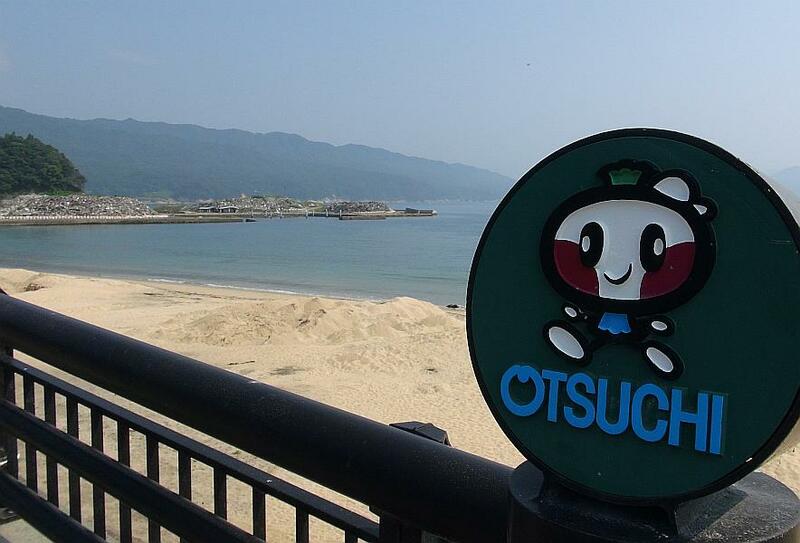 Route 45 heads inland before returning to the coast and approach Ōtsuchi. There is a lot of rebuilding work going on here. My camera’s memory card is filling up fast. I want to download some of the images to free up space. On the way out of the village see what might be a shop where I can do it so go to see. It is in a temporary shopping centre built from temporary buildings. I am wrong about being able to transfer images but while there someone calls to me. He comes over and asks what I am doing. He saw me at Yamada Road Station yesterday and is curious to know what a gaijin (foreigner) is doing riding a bike here. I tell him and he invites me to his office for a drink. He is the volunteer centre boss and has been there since a few days after the tsunami. Weekdays they usually have a handful of volunteers with weekends being busier. Mostly they do gardening work or giving people massages. There are two brothers from Slovenia, whose mum is Japanese. Their English is much better than their Japanese so we chat for a while before they leave on a job. I see them later on the way out of town. I ask if I can be a volunteer here and told yes, I can stay as long as I like. 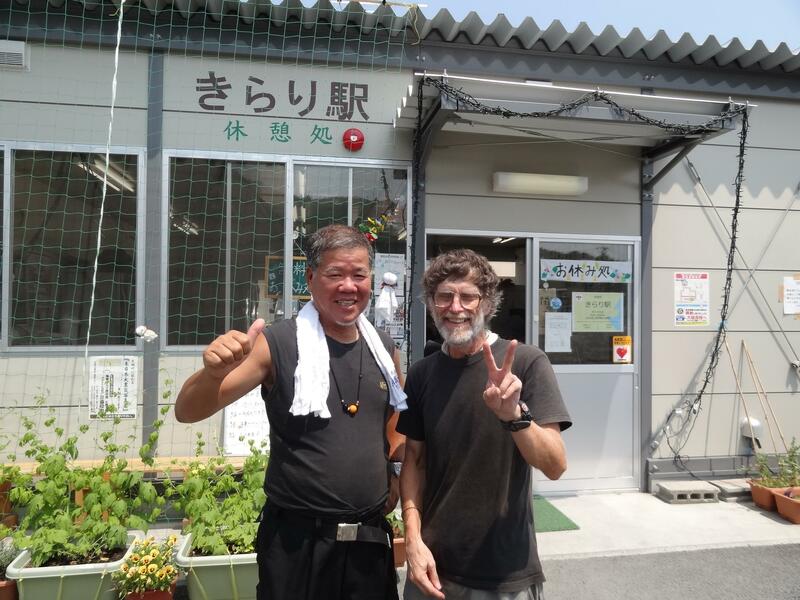 I am given a guided tour of the volunteer centre, which was the North Ōtsuchi elementary school. It is behind the temporary shopping centre. The wave reached to the ceiling of the ground (first) floor, a considerable way inland. Only the second floor is used to accommodate volunteers. 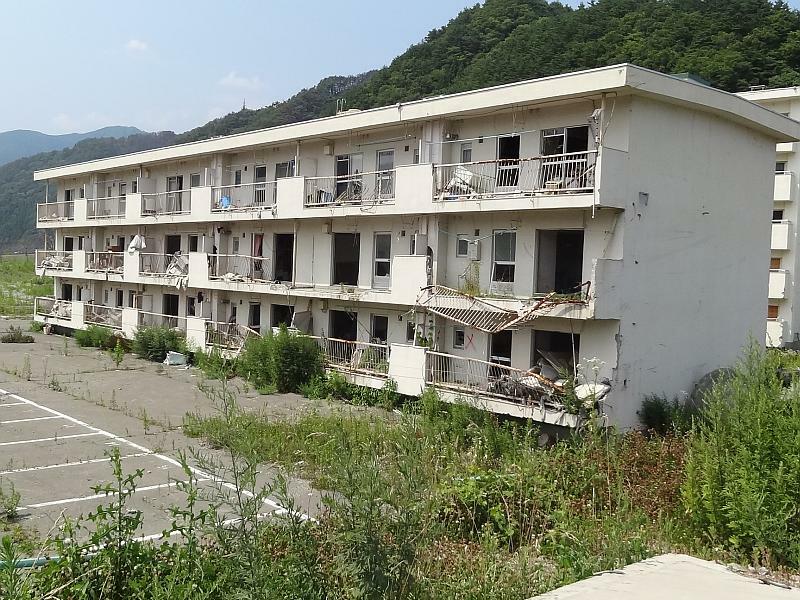 When the time comes, the building will be demolished and replaced. The temporary shopping centre is due to be replaced in two years. New houses to be built will be away from the shore and residents will live on the second floor (1st floor in NZ) with the first floor (ground floor) used for other rooms, such as garages. The town’s commercial area will be in the danger zone, but no-one allowed to live there. I’m allowed to use their computer to transfer my images to the hard drive. As much as I want to stay and help I must keep going. Today is the 4th day and still not half way to my destination. So say goodbye. By now it noon and I decide to have lunch in the new mall. While eating in the sitting area, a lady joins me at my table. We make eye contact, smile and she offers me a share of her food. I accept the first time but decline the second. We don’t say anything. 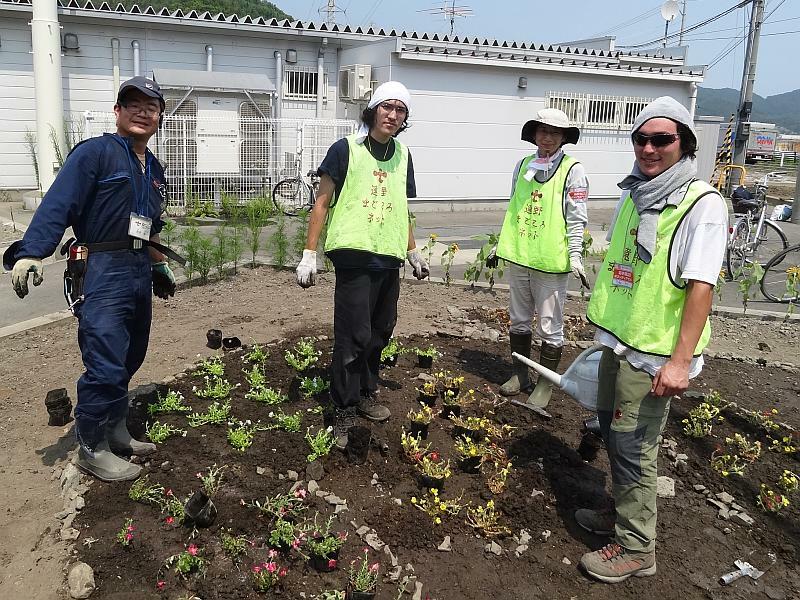 On the way out of town I see the Slovenians and the Japanese lady volunteers doing some gardening so stop to take a photo. The Obon Festival is fast approaching and they want to get the town looking pretty. The flowers they plant do add a touch of colour. 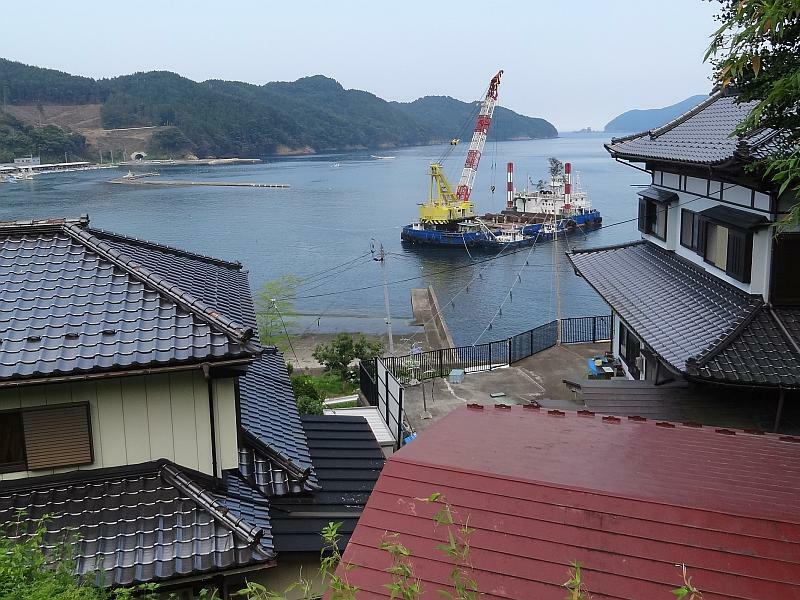 Hamayuri, the sightseeing boat that was left sitting on top of a building has been removed, but discussions are underway about making a fibre glass replica as a memorial. Going south pass through Unosumai. 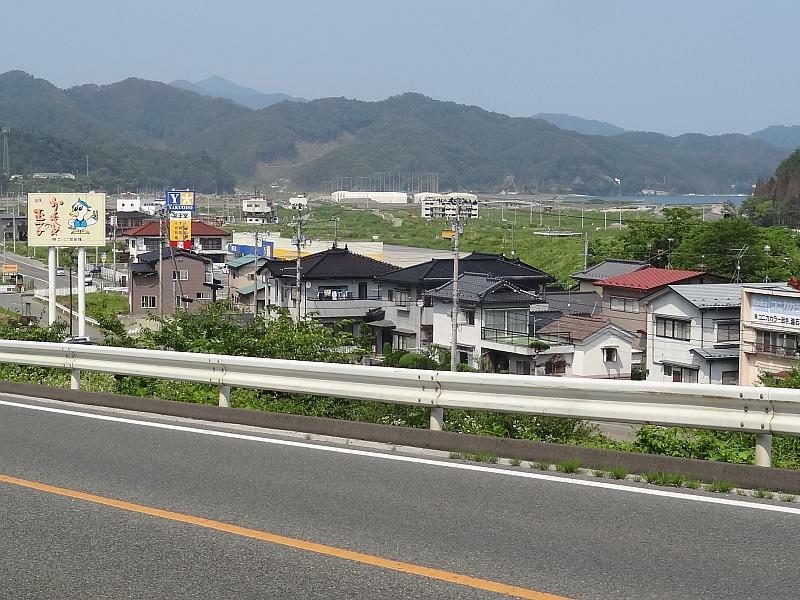 At Ryoshi, only 15 out of 230 houses survived the tsunami. 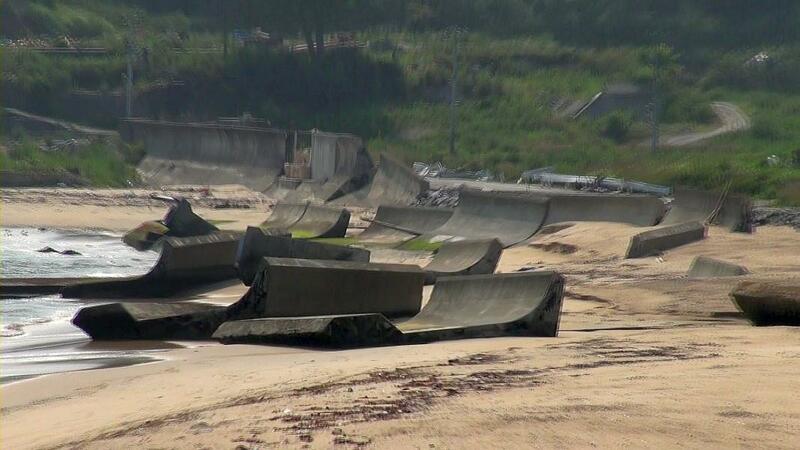 It is thought the sea wall at Kamaishi deflected some of the waves’ energy that helped to increased the wave height to 19m here. 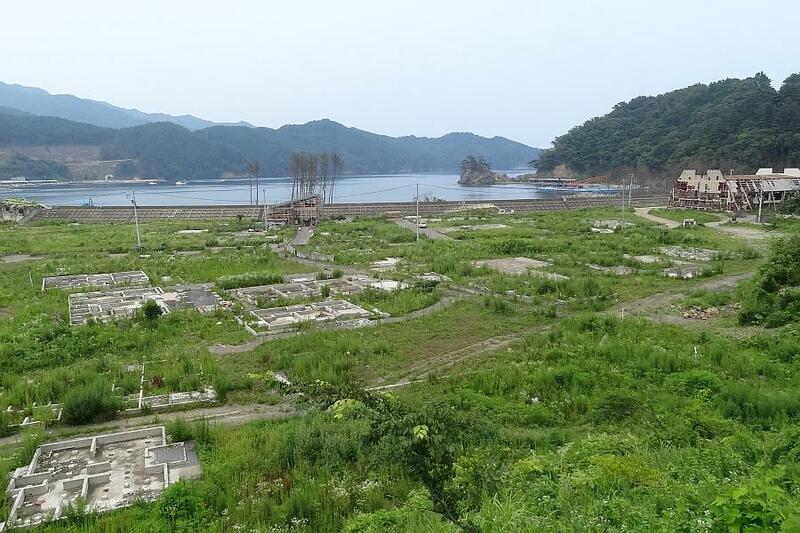 It topped the sea wall and went several kilometres inland up a narrow valley. 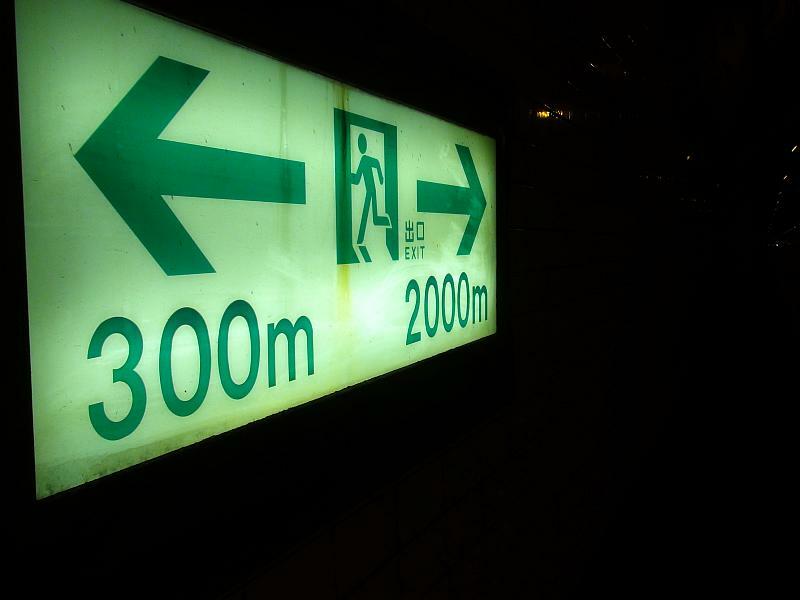 After Ryoishi go through one of the longer tunnels and have a scary moment. When crossing over slippy uneven edge of the road I nearly come off. I just manage to stay upright and avoid the wheels going sideways and out from under me. 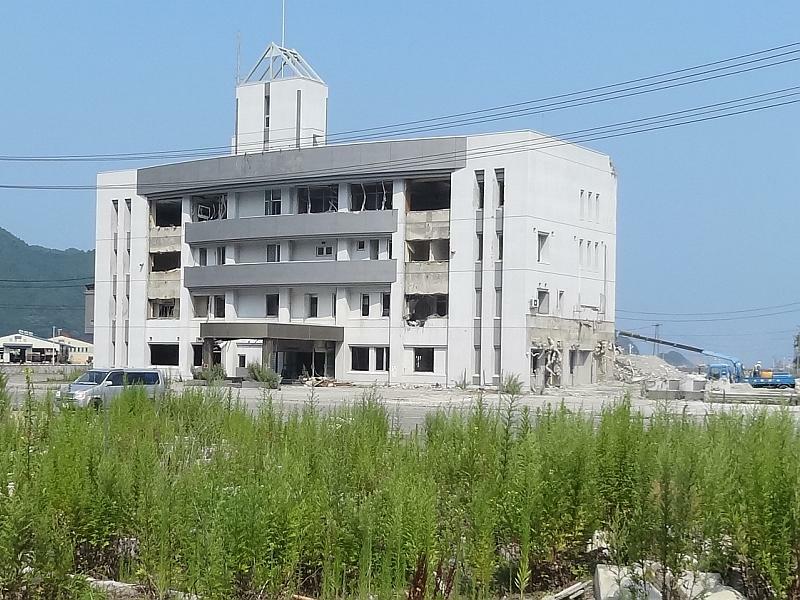 Then suddenly pop out the other end in downtown Kamaishi. Downhill and moving fast, the road is busy and I’m not sure I am on the right road, or even if it is a car only road! 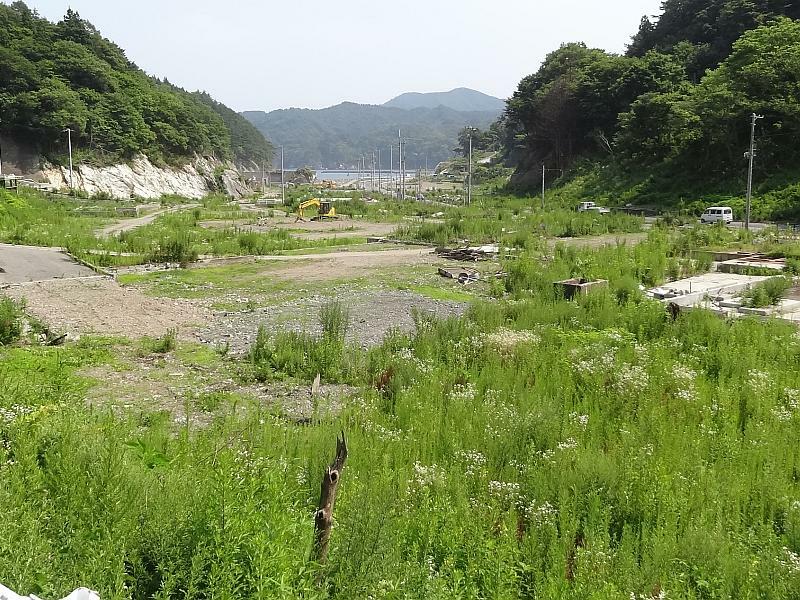 Kamaishi was famous as a major steel making town but production ceased several years ago. As a consequence the town suffered a decline in recent years. It has (or had) a museum dedicated to steel making. The breakwater at the entrance to the bay is famous and made it into the Guinness World Records. The stats are impressive – 1.6km long, 70m deep and rising 6m above the water. It took 30 years to build at a cost of US$1.5billion. 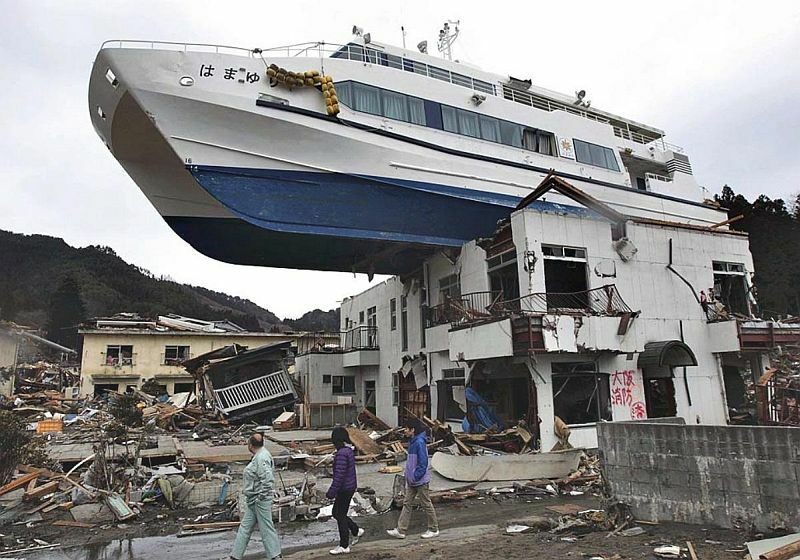 Completed just 3 years earlier, it collapsed when hit by the first wave and failed to save the town. 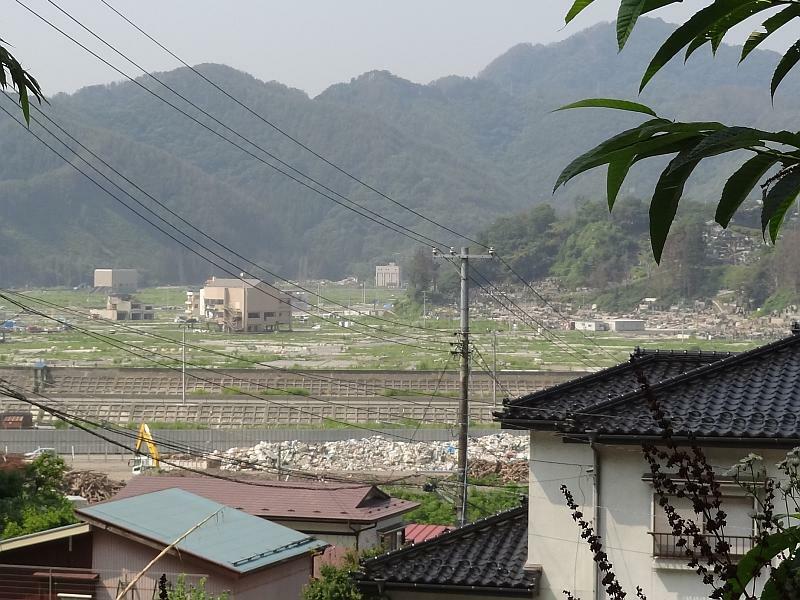 In addition to that it is suspected to have made things worse at nearby Ryoshi and Kariyado (see above) by deflecting some of the wave’s energy towards those settlements. 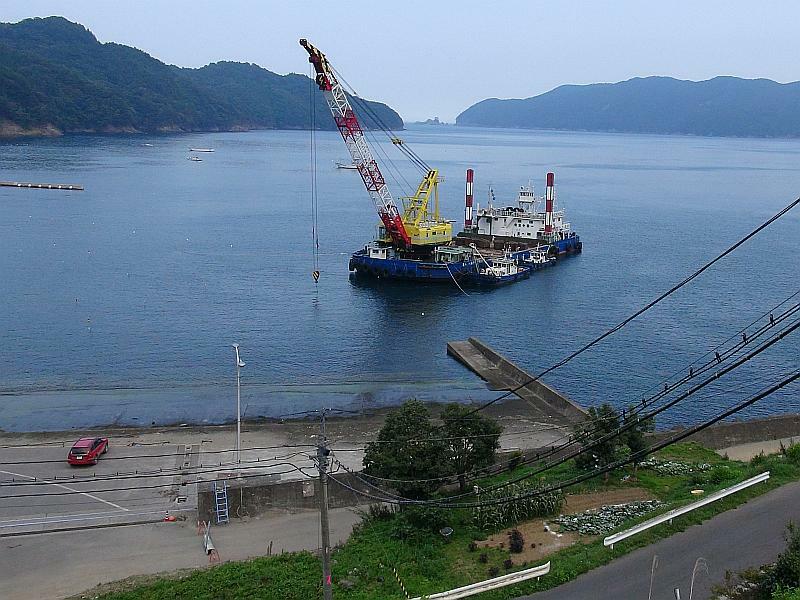 In spite of the above issues, the government has decided to rebuild it, read http://www.nytimes.com/2011/11/03/world/asia/japan-revives-a-sea-barrier-that-failed-to-hold.html for more info. Heading out the other end of the town, observe an impressively large statue of the Kamaishi Daikannon at the Sekiohzenji Temple. 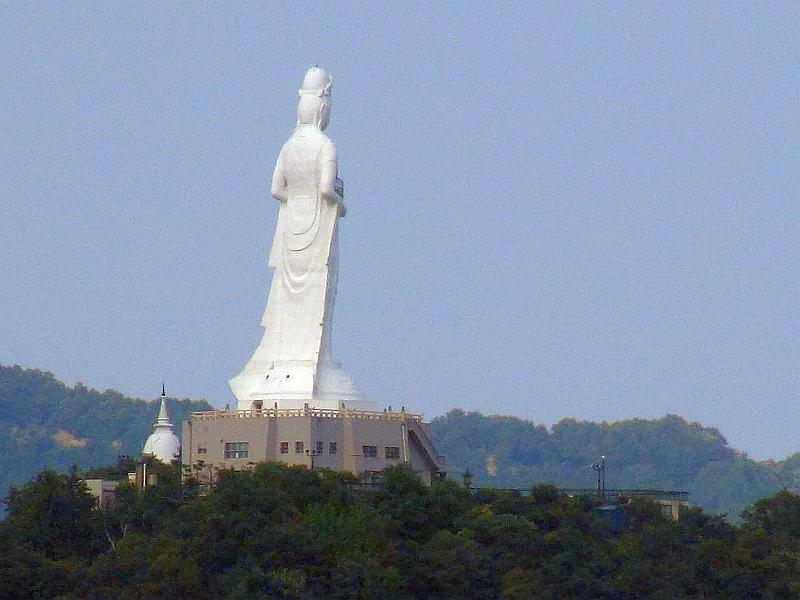 It is 48.5m tall and was built in 1970 to attract more tourists to the area. The steep hills and tunnels continue all day. Emerging from another tunnel the road skirts round the back of Toni Bay with a large floating crane doing some construction work. Here it is clear the land has sunk, by up to 0.7m. Here I have the option to go to a campground off Route 45 on Prefecture Road 275. It us quite a way to go so decide to stay on Route 45. Floating crane in Toni Harbour, note the foreshore was once above the waterline. 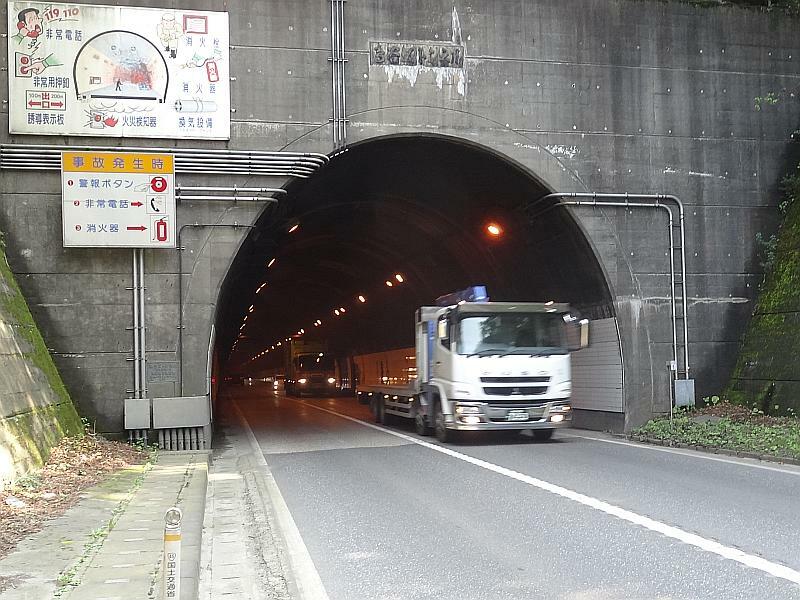 Pass through Heita, between Toni and Yoshihama is Kuwadai Tunnel one of the longest at over 2km. Then arrive at Sanriku. 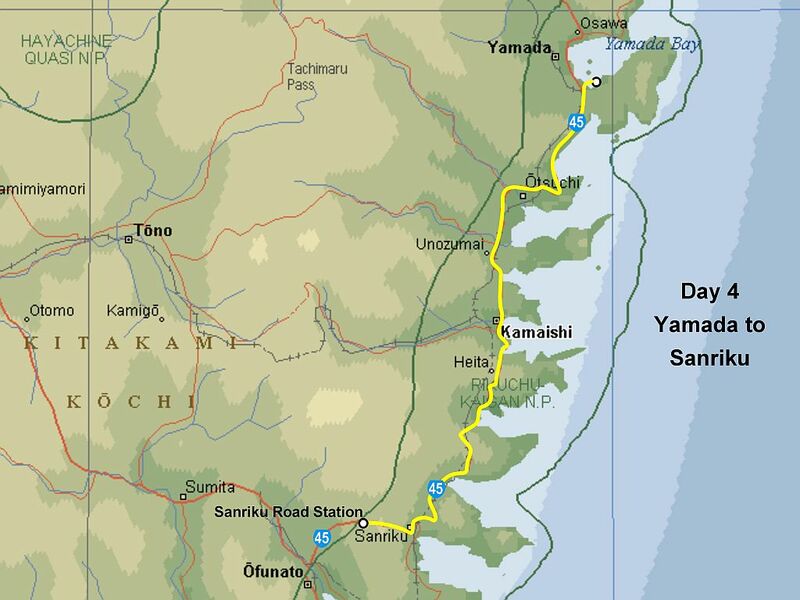 There is an option to go to a campground along Prefecture Road 9 but it is quite a long way and looks hilly on the map. Otherwise there is one last 2km hill to climb on Route 45 but it is particularly steep. Much of it is without a shoulder. 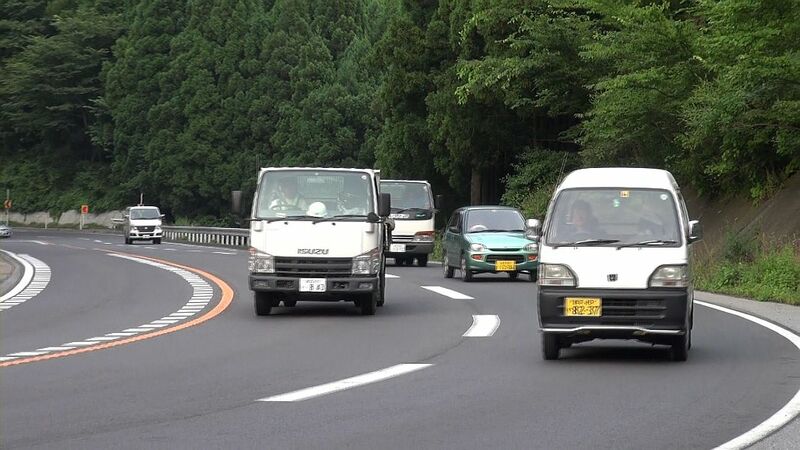 The driving is some of the worst I have seen in Japan – more like NZ! I must take really extreme riding tactics by staying in the middle of the lane (while doing only 3kmph) to force motorists move over into the other lane. A race to the top – crazy car driving! As the road eases to a gentle climb there is the welcome sight of Sanriku Road Station. One of the staff speaks good English, I ask if it is OK to camp and I am told yes. There is a nice grassy area at the far end I have my eyes on. Get into a conversation with the staff. Like everywhere they laugh that I am riding around Japan on a mama-chari! Have ramen in the restaurant before it closes. Later while sitting in the shelter waiting to pitch my tent a truck pulls up and the driver leaves his engine running. Oh no, not again! Later again, a second motor cyclist arrives and comes over. Tadayuki is from Kyoto, and heading to Hokkaido. He quit his job and is taking a long holiday. Later we both go to the other end of the road station and setup our tents in the shop doorways. It is sheltered and quieter than on the grass next to the trucks.